To those of us who have been involved in our sport for a number of decades it sometimes seems that out sport is timeless. We still load up the bar on the platform and then try to lift it. The referees have always sat in front; the lights always come on when we had finished, etc. But if one were to sit down and review all of the changes that have occurred over the last 60 years or more he will be astonished at the number of such changes. The best way to do this is to try to remember our first meet in some distant decade and then compare it to the one we worked at last week. Let's start at the bar. The barbell has not changed fundamentally since at least the 1928 Olympics where the Berg revolving sleeve barbell became the standard. Attempts at standardizing the bar were attempted as early as 1905 or so but could not be finalized until the lifts were finally standardized in 1928. Only a few superficial changes have been instituted since then, such as the markings. A women's bar was added in 1996, with colours that distinguish men's from women's in 2000. Pounds to Kilos - In Canada most sets prior to about 1970 were graduated in pounds. The changeover occurred in the early 70s due to increased international exposure of our officials as well as Canada's anticipated metrification. In addition, the Russian "World Record" set was popular at this time and was only available in metric. This conversion was not done abruptly. One year we were lifting, for example, 265 pound weights ("pre-conversion"). Then in 1968 or so Maurice Allen recommended that all new sets purchased be metric. This advice was not immediately followed because it was still easier to buy York pound sets. Then there was a transitional period of what is now called "soft conversion" when we would refer to a 264 pound weight. Finally, with more Europeans contact people got used to the idea of a 120 kilo weight ("hard conversion"). 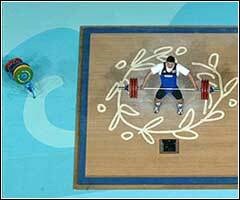 In Olympic WL oriented gyms 45, 35, 25, 10, 5, 2.5 pound plates, 5 pound collars and 45 pound bars were gradually replaced with 20,15,10,5,2.5, 1.25 kilo plates, 2.5 kilo collars and 20 kilo bars. Power lifters took somewhat longer while the weight trainers are still in a long transition. Rubber - The French produced the first rubber set in the early sixties. The first time rubber plates were used in Canada was probably at the 1967 Pan-Ams in Winnipeg. The Berg sets used there did not please Uncle Bob Hoffman. But after Winnipeg we waited five more years before adopting rubber. 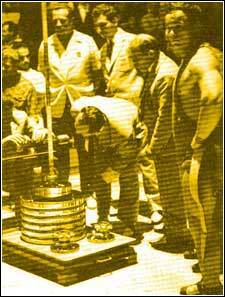 Schnell plates were prominently used in the 1972 Olympics and mentioned in the IWF Rules. After that the world and Canada finally accepted rubber. Rubber - came about because they were more floor friendly. As the records increased York and other companies found less room on their sleeves. The only thing they could do was to decrease the width of the plate. But this made the pressure per area even greater. So a combination rubber-iron plate was invented that was narrower than the old irons but wider than the new ones, and softer to boot. They were also more expensive to buy and had a shorter life, something iron plates did not need to consider. Diameter - The size of the heaviest discs have always been 450 mm. 15 kilo plates have only been full size (diameter) since the 60s. The Russian "World Record" sets had them first. This was a welcome development for junior athletes. They also spread the impact on more barbell surface area. We now have full size 10s and even some 5s and 2.5s. Weight - 25 kg plates were also added in 1972. Four years later 50 kg rubber plates were added. They did not catch on in the market. Colour - Colour coded plates also became established after Munich. The 25s were red, 20s blue, 15s yellow. 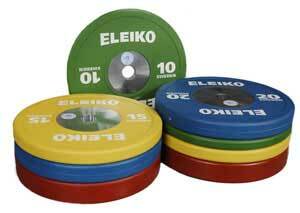 Green 50 kg plates were added in 1976 but were seldom used due to their being nearly as heavy as some loaders. They were gone by 1980. By 1984 10kg rubbers were black but iron versions had no standard colour. In 1988 we got green 10s, white 5s, black 2.5s, chrome 1.25s, .50s and .25s. The rubber 10s were then made green. Precision - In the old days the standards were not so strict. One time a locally made bar was used in the US Nationals. It was off-handedly referred to as a "maverick" bar by Bob Hoffman since it was five pounds heavier than it should have been. A sorrier word was never spoken in the barbell world. In years gone by it was common to lift York barbells with no collars, whether in training or competition. This was possible due to the tight fit. The rules were changed in 1972 to require collars. York used the standard two clamps to grip the sleev plus a revolving screw-like device to tighten it against the plates. This copied the Berg original and was also used by Eleiko and most others. The device worked but it was also awkward to use. So at the 1958 Brussels Worlds Fair the Soviets introduced to the world their revolutionary new "World Record" barbell set displayed by Zhabo above. Its plates were made of steel, not the usual cast iron. This meant that they weights would "ping" instead of "thud" when slammed together. The plates also were edge trimmed with chrome or stainless steel while their sides were painted blue. This made for very photogenic competition shots. Those taken by George Kirkley (GBR) were classics. But probably the most talked about feature was their ratchet collars. The sleeves had a series of grooves that allowed a ratchet clip on the collar to catch and secure the collar into position. Slippage was then impossible, while a screw device without the usual levers could make the finer adjustments against the plates. This all made for a very clean looking appliance. This barbell was only about US$300 in the 1960s, considerably less than a York. This caused Uncle Bob no end of grief, prompting him to write an editorial titled "Trading With The Enemy". That one was equally famous in that he forgot to plug "Hi-Proteen", for once in his life. First used in the 1962 Worlds the set was very popular in the late 1960s. It remained so until rubber took over in 1972. It was. The collar system never did catch on due to the wider sleeves necessary. This prompted the IWF to make 50mm sleeves standard. They may have done this so as to not make all previous sets obsolete. The Soviets were somehow allowed to use a rubber version in the 1980 Olympics that was still outside the rules. In the 1972 Olympics the Schnell barbell took centre stage for a few years. It reverted to what were essentially exercise collars. These had a single screw lever that wound against the sleev. This was very simple but fine adjustments to secure the plates were not possible. What finally did them in was that tightly screwing the collars dented the sleeves. Platforms have always been the big pain in the glutes when setting up a meet. The rules say 4x4 metres but we seldom bothered in the old days. Back then we settled for an 8'x8' compromise. Not regulation but a lot easier to set up. Into the 1970s we decided that we wanted something closer to regulation. We had a problem then and we still have it today. That was that plywood still comes in Imperial 4'x8' sheets. We could get a 12'x12' platform but adding that extra foot or so was, and remains a real pain. The height of the platform was not standardized until 1980 (50 <>150 mm). Platform edges were not painted before about 1980. The pre-1992 measurement of the coloured edge was 50 mm. Wood remains the standard material, often supplemented with conveyor belting under the plate areas. Some attempts at lightening the platform have been made. A light-weight platform made of small interlocking plastic blocks were used to great advantage by a pre-immigration Andy Merrylees' crew at the 1985 Junior Worlds in Scotland. In days gone by we simply used the Roman style "thumbs up" or "thumbs down" method to signal decisions. But often there was someone in the local WL bunch who could wire up a traditional light system with a Chief Referee override switch. But many did not like the dependence on the Chief Referee that the system engendered. The Soviets found a better way. In the 1975 World Championships in Moscow a new system was unveiled that did away with the idea of the centre referee being in charge, plus a few other features. That is why it was once known as the "Russian" or "Soviet" light system. The first one in Canada was developed in Alberta. It was first used at the 1978 Tofield Open as a test for the 1978 Commonwealth Games. This was a great improvement but now such WL light systems are beyond the abilities of amateur electricians. We always tried to use the best scales possible. This meant a balance scale. Electronic scales came along in the 1970s. Technology didn't help here. Everyone still claimed that the device weighed "heavy" just like they did with the balance scales. Scoreboards have been used since the early 50s. By the time of the 1972 Olympics we were using electronic boards. These added greatly to the sport's presentation but problems were soon to develop. One was that items most marginal to the competition, such as the scoreboard, were now costing the most. In addition, due to bulk, complexity and expense there was no market for the board after the competition it was made for. They also took a lot of manpower. The people that were roped into such duties were often unfamiliar with the sport, so errors on the board could drive a TC mad. And finally, a board big enough for everyone to see in a World Championships hall might not even fit into the room for even a Nationals, let alone a local competition. So there was a latter day trend back to manual scoreboards. But even this seemingly retrograde development has brought benefits. Today the local lumber company foots the bill because the board happens to be a great advertising vehicle. People are looking at it all week where they can see that the company is contributing to amateur sport. However, technology does not stand still. Pocket calculators appeared at the time of the 1972 Olympics roughly, and were a boon to scorekeepers, especially for formula calculation. They did not help on the big scoreboard at this time. This would have to wait until the invention of electronic spreadsheets that could then be hooked up to overhead projectors. This is where we are today. Improvements are made constantly now. The IWF has their own proprietary system that must be used at the big meets. But any computer buff can set up a workable scoring system today that will be adequate for small local meets. Warm up rooms have changed little over the years. That is still where non-lifting athletes seem to prefer to watch the competition from. The video replay screen is new for 1997. These should show live action during the lift and if possible replays at both real time and slow motion between lifts. Such facilities are needed so that the athletes can stay in the warm-up room as long as possible. A new item just off the competition stage now must be provided for. This is what I call the "Sweat & Fret" area. Figure skating has a "Kiss & Cry" area for their competitors to await judges' decisions. In recent decades lifters have appropriated chairs to sit down on while waiting for an upcoming attempt. In the meantime they sweat & fret, hence the name. The weightlifting costume probably evolved from the animal skin-like stage costumes of the professional strong-men of the 1890s vaudeville and music hall era. Little was changed through to the 1950's. Most suits still were cut similarly but by then were of cotton or wool with no legs and narrow straps with solid colours, mostly black with some blues and whites. Wrestling suits were similar in cur and easier to obtain so were often used. Others lifted in swim trunks and T-shirts. The Russians then predictably added red suits. The first major change came in the 70's as synthetic fibres took over the field. They were lighter, could stretch, were easier to clean and held their shape better. The range of colours broadened as well but the essential shape remained. Then leg lengths and strap widths were altered. Legs were cut ever higher until the rules had to intervene to protect decency. At this time women entered the sport and were apprehensive about wearing these high-cut suits. They were worried about painful leg scraping potential as well as decency. By the 1980's this situation, the prevailing close pulling style and the market popularity of cycling shorts caused a stampede in the other direction. Lifters started wearing these shorts under the costume to protect the legs (most lifters' thighs were rendered hairless by the constant scraping). In the 90's manufacturers saw the opportunity and lengthened the costumes nearly to the knees. This was much more comfortable if not so photogenic. The advent of women lifters brought further changes. Even more colours and patterns were tried as well as imaginative new style features more conducive to the female form and temperament. They also experimented with shoulder covering gymnastic costumes. These changes all eventually came to influence male costumes as well. The latest in costume evolution now includes those that combine the costume with the shirt, with slippery thigh portions and rough spots on the shoulders to help performance. In the 1950s fleece warm-ups in dark, solid colours were the order of the day. 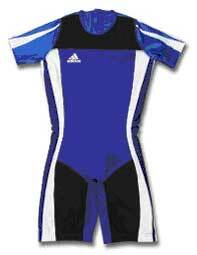 In the late 1960s Adidas introduced three stripe training suits so that their trademark could be seen from greater distances. These were introduced to the track and field people first but soon the various Games team organizers were offered them by manufacturers as advertising devices. They then became standard team issue to all sports, who enthusiastically adopted them. Addidas and others this had thousands of walking billboards carrying their logos. But wisely they never insisted on corporate colours. These new suits became useful at a time of greatly increased international and interprovincial competition in all sports. The warm-up suit was a natural place to showcase some athletic heraldry. Such clothing was available in many colour combinations which in turn led to them being designated as official team uniforms, all in team colours. WL was no exception. Soon Ontario was in red & white, Quebec blue & white, Sakatchewan green & white, etc. Then the thousands of walking billboards became millions as non-athletic fans eventually appropriated the look. Weightlifting shoes have changed some over the years. After WWII many top lifters cut down a pair of boxing boots and added a heavier sole and often a higher heel. Lesser lights just used a pair of work boots. At that time there were no restrictions on heel heights. Two inch jack-ups were common. The high heels were often necessary to the non-flexible squat style lifters of the day. In the 50's specially made lifting boots were first seen on Russian and Polish lifters, all with high tops and normal, low heels. In 1984 heights were limited to 130 mm. were junked as coaches now preached ankle flexibility and low heels. The 60's saw similar commercial varieties marketed by York, Addidas, Puma, Karhu, Tiger and others. In the early 80's, just as running shoe styles went back to the high top after two decades of the low cut, weightlifting (as is often the case) went counter by removing their tops. Belts have evolved in recent years after many decades of just being belts. At one time many belts were made of one piece of belly leather with a harness buckle at the end. This eventually fit the back like a glove. 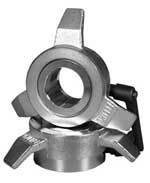 Then lifters discovered that two thinner pieces sewn together made a firmer but less fitting belt. At this time of three lifts reinforcing materials between the two pieces were not allowed but sometime snuck in illegally. Once the press was dropped, so was this restriction since there would be little motivation to do so now. In the 1970s the Russians added a piece of leather under the buckle to prevent belly pinching. Then the Bulgarians moved the buckle over to the side to prevent belt hitting in the clean. Others added padding to the inside of the belt. Now inflatable belts similar to the Reebok pump system in shoes are coming to solve the problem of rigidity vs. comfort. In addition we now see belts made of nylon, Velcro and other non-traditional materials. The width rule for many years was 100 mm until it was increased to 120 in 1980. This is so that athletes are not tempted to rely too much on external support. This rule had more relevance in the old days of the Olympic press when exaggerated lean backs were common. A wide belt could also cover up illegal abdominal bandages. Today, however its need is less important. Most belts in use today are still under 100mm. The only change from 1988 was the legalization of rubber bandages. It was thought that although they might give some rebound at the bottom of a clean they also keep the knees warm and far less susceptible to injury. In the Medical Committee's opinion this factor outweighed any possible undesirable technical advantages. The real reason they were initially banned was because they were sold by Bob Hoffman who was a constant irritant to IWF General Secretary Oscar State in the 1960s. The following section presents a visual analysis of the evolution process in Olympic weightlifting by comparison of post WWII Olympic champions in various weightclasses. Please select the weightclass and proceed by scrolling to the right - from 1948 Olympics in London to 2004 Olympics in Athens. Some older browsers don't support the web technology used to generate the Super Study. If your browser doesn't, you will not be able to view the gallery of this athlete.